The new KARPER RS bait is due to launch in 2018, but what are the origins of the bait and how did it come to be. 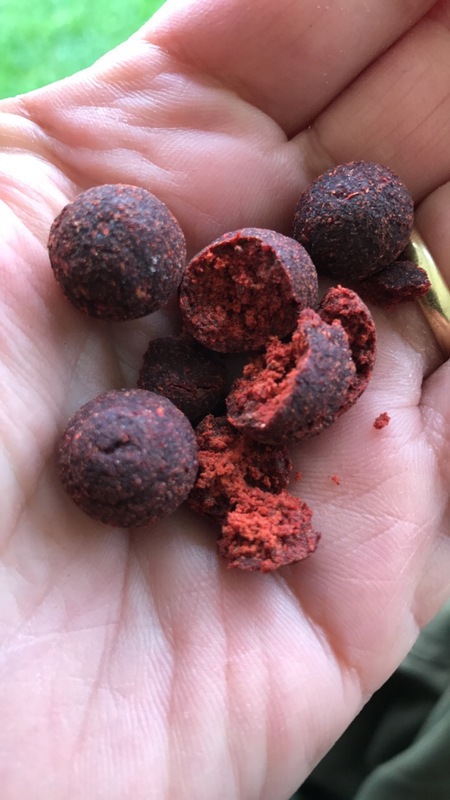 The RS boilie origins dates back to the early 1990s in relation to use of certain bait ingredients, but due to issues with availability of these ingredients it was only possible to create the final development of the bait towards the end of that decade. 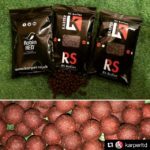 The RS bait ethos was to only use the ingredients and attractors that had been previously tested and that the Carp had shown a high preference to liking. 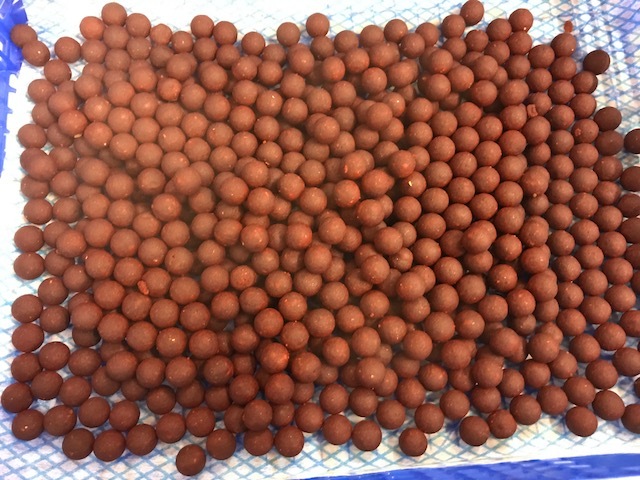 The best ones of these would then be formulated into a base mix to create single boilie. The Theory was that if the most attractive ingredients were then combined together they would then create a highly desirable bait. We also wanted to push the boundaries in relation to inclusion rates of these ingredients. Finally we wanted a bait that was soft in texture, would crumble in the hand easily, firm enough to be used in a throwing stick, but also able to slowly break down in the water. Once the ingredients were finalised, we set about making up a number of test batches of the base mix. These test batches all contained different ingredient inclusion levels. A number of one egg mixes were then produced and we set about testing against the above criteria. After a lot of trial and error we finally arrived at our preferred base mix which would then be put forward for the next stage of testing, pond tests. At the pond test stage we added a fruit flavour to the base mix; initially we used a commercially available flavour and then subsequently formulated our own blend. For the pond tests we created a matrix of different flavour levels and boiling times and then set about testing these different batches and observing the reaction to the bait. To cut a long story short this process took about 10 months to complete and to finally determine the best combination. The final recipe had fish feeding on the spot, clearing the bait and then returning and clearing the spot off until it was completely clean. Pond tests are of course not the same as testing in a real life fishing situation. Fish in captivity do react differently, but as best as we could determine we had something that the fish really enjoyed eating and seemed it seems that we had created something a bit special. 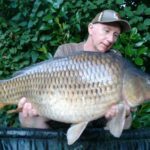 The next stage was to try the bait in a life real fishing situation with the first tests taking place on a short evening session at a well stocked local pond. 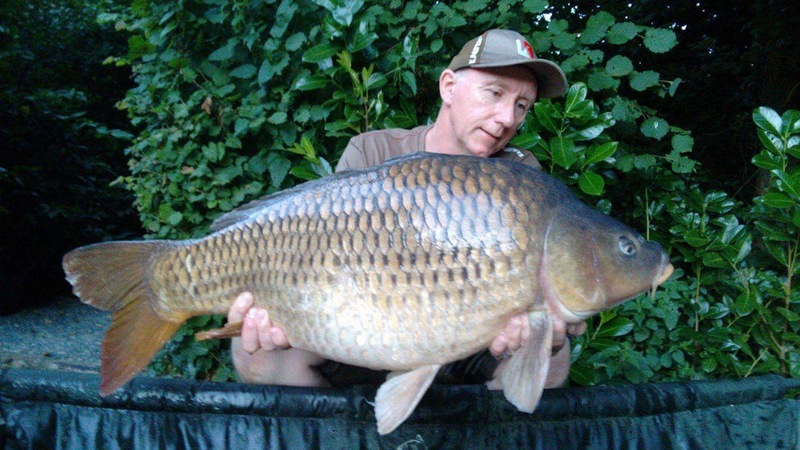 On average you would catch in the region of six fish in a short five hour summer evening session. First time out the bait produced sixteen fish and then a few days later another fourteen fish from the same water. 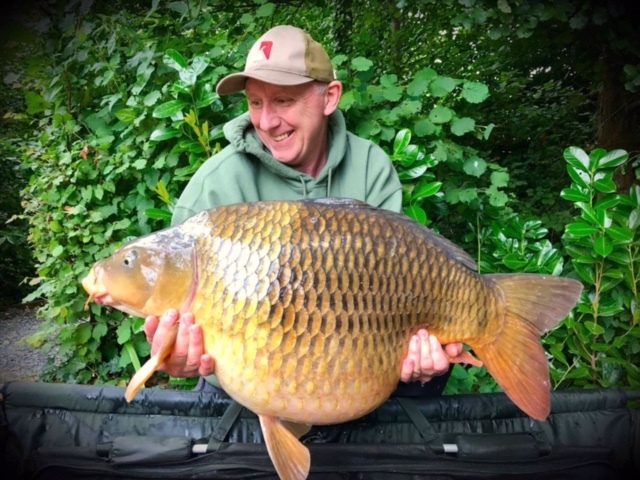 These initial results made us think the bait was going to be a bit special and nothing has changed our minds since. The RS has never been made commercially available until now and in the past only a select few had access to it. There were many reasons for this, but the important thing is that we are now really excited to release it to the general public. So what does the title RS stand for in the title….quite simply Red Special? It is no secret that the R in the title is simply referring to the unusually high amount of Robin Red contained within the bait which gives its very distinctive colour. The S in the title refers to the special combination of fruit flavour blended for us. 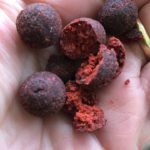 The bait itself is hard to categorise, but we would say it sits between a birdfood and fishmeal bait a hybrid combination, however we might add that the fishmeal contained in the bait is not added in its traditional form. The base mix itself is made up of nine ingredients, some of which are a single ingredient with a complex make up. We add at low levels a blended fruit flavour to give the bait its distinct fruity smell. 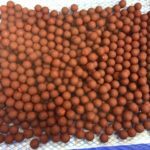 One of the most important things is that the bait is mixed in two stages to ensure even ingredient distribution throughout the base mix. We do this by mixing the bulk ingredients and the attractors separately. The Base mix is then allowed to stand for a minimum of a month to allow all the attractors to permeate throughout the entire base mix. The bait will be available from April 2018 and will only be available in frozen format. 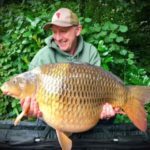 Over the years the bait has been proven to be very robust on the bank and for longer sessions keeping it in an air dry bag and turning regularly is all that is needed to keep it tip top condition. We hope you enjoy using the bait and will keep us informed of your catches. This entry was posted in Carp Bait. Bookmark the permalink.